New York City contains 9 million people speaking 800 languages, and at first it may appear that we have little in common besides frustration with our aging subway and high rents. But if you dig a little deeper you’ll find New Yorkers—like any group of people anywhere in the world—all speak a common language of survival, honed over thousands of years. It’s called cooperation. And in 2009 a group of Brooklyn activists set out to learn, and map, how this language is expressed across our communities. We called it ‘the solidarity economy.’ We didn’t make this up, although if you’ve never heard of it you might imagine this was our little band waxing poetic. Actually, rather than name it something new and claim the discovery for ourselves (a favorite colonizer trick), we looked to our elders and the global justice movement for direction. Solidarity economy was an existing term among anti-capitalist thinkers, widely used in South America, to describe economic activities that were bounded by values and practices of democracy, ecological sustainability, cooperation, mutualism, pluralism, and social and racial justice. Content that we had enough of an idea what we were looking for, we set about researching the people, organizations, challenges, and successes of New York City’s solidarity economy. The activists who created the first solidarity economy map for NYC— and one of the first in the U.S. —originally met at the 2009 US Solidarity Economy Forum, in Amherst, Massachusetts, organized by the US Solidarity Economy Network (USSEN). We came from different communities, movements, ideologies, and practices. In truth, we didn’t have enough in common to sustain an organization, such that once we completed our first map the group began to dissolve . Cheyenna Layne Weber and Michael Johnson observed this and took up the task of creating a collective to hold the ongoing research, organizing, and popular education work that they and others had identified were needed to bring a coherent solidarity economy movement into focus for New York City. Together, they formed the collective SolidarityNYC in 2010. Caroline Woolard, Amelia Bryne, Vanessa Arcara, Jeremy Friedman, Daniel Apfel, Jessie Reilly, and Annie McShiras were among the first people to join or participate in the new group . SolidarityNYC grew in membership and influence from 2010-2014. (Much of that story has already been captured by Mira Luna, if you want a deeper dive.) Collective members built a wide network of solidarity economy leaders and practitioners across the five boroughs through storytelling (short films, an online interactive map), research (qualitative interviews with leaders from each ‘sector’ of the solidarity economy, sectoral network meeting and event attendance, participation in co-ops), popular education (workshops and walking tours), cultural change work (internal trainings to build our cooperation skills), and organizing (volunteering in roles to support the development of new initiatives in each sector, connecting sectors to each other, connecting sectors to social movements). This brought us into some interesting conversations about scale, movement building, and challenging how our city prioritizes corporate-led economic development that usually harms low and moderate income people and communities of color. 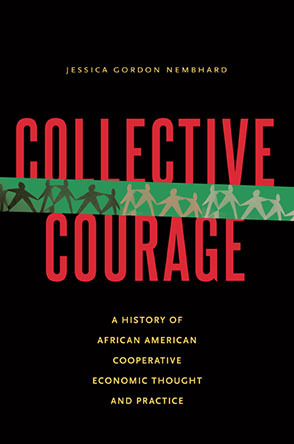 Those conversations included communities of veteran co-ops and newly-interested activists. We did a lot of connecting the two: during the 2012 UN Year of Cooperatives, our map and films were highlighted in the citywide gathering by Cliff Rosenthal at the Ford Foundation and an exhibition at the BMW Guggenheim pop up museum curated by Omar Freilla; our inboxes stayed full of individuals and groups asking for referrals or introductions; during Occupy Wall Street we actively bridged the gap between the new movement and longstanding organizations by spearheading the creation of an Alternative Economies Working Group and a Worker Co-op Working Group (learn more about our work at OWS here); and our research was used to convince the New York City Council to begin funding for worker cooperative development in the Worker Cooperative Business Development Initiative. As our formal collective learned more of what these different communities needed we created opportunities for them to gather together to meet shared goals. This was, and remains, a core component of our organizing strategy: peer relationships across sectors of the solidarity economy are the foundation of cooperation. Rather than try to own all of the information and relationships, we emphasized educating people about the scope and breadth of the solidarity economy so they could choose what was most pertinent to their work at any given time. This education, along with ample opportunities to network among those they might newly perceive as solidarity economy peers, was our goal. Much of this work first culminated in the release of our 2013 report, Growing a Resilient City, and a gathering of the solidarity economy leaders we’d interviewed and were learning from. Leaders identified their priorities and broke into working groups. Enthusiasm and energy ran high among the 70 or so people in the room, and we were elated. The solidarity economy framework resonated for people, and they were hungry for more. As an unpaid volunteer collective, SolidarityNYC had limited capacity. Zara Serabian-Arthur, Olivia Geiger, Annie McShiras, Jessie Reilly, Amelia Bryne, Caroline Woolard, Lauren Taylor Hudson, and Evan Casper-Futterman supported research in one way or another (interviewed, analyzed, created frameworks, cowriting). The organizing was mostly carried out by Cheyenna Layne Weber for 20-30 hours a week, with additional support by Michael Johnson (who was retired and supported by the Ganas Community) particularly with worker co-ops. That situation was unsustainable, since while Michael was retired everyone else was working other (paid) jobs, and the collective was flummoxed about what the next steps should be. We tried supporting the working groups to find their own volunteer leaders and commit to convenings, but they fizzled. Within 6 months of the Growing a Resilient City gathering, the collective was convinced that a central solidarity economy network organization was needed for New York City. This work needed to become paid, become formalized, and become fully accountable under a membership structure that the solidarity economy practitioners controlled. But how to get there? We didn’t quite know, though we suspected it would require a new organization. We’d played with this idea before. Prior to founding the collective, Cheyenna and Michael met repeatedly with Mike Locker and Dave Hancock, of Locker Associates, a labor research group, to frame out what a ‘network of networks’ or ‘solidarity economy hub’ might be. Overtures to philanthropy fell flat so eventually we sought to just do the research that led to Resilient Cities, rather than try to fund it. We paid for the research, transcription, and event by throwing a big party and primarily utilizing volunteer labor. (Prior to that we put on a Kickstarter to fund our short films.) Just going ahead and doing the work, without capital, would prove to be a crucial part of our strategy. This has pros and cons, of course, but in the short term it meant we stayed true to our vision and values rather than assembling projects attractive to philanthropy. Enter the Rockefeller Foundation. Through collective member Caroline Woolard’s work in the art world, our report had made it onto the desk of a NYC program officer, Edwin Torres. We met with him repeatedly, introducing different ideas about solidarity economy, and growing his and others’ knowledge about the field. In the end, he gave us what what was left over in his budget in 2013: $50,000 to host focus groups and lay the foundation of a central network organization. He championed and coached us, and we never would have gotten that funding without his trust and advocacy. It was the first time we wrote a grant together, and we didn’t do it alone: besides Eddie’s help, we’ll always owe Lisa Silverberg (organizational development consultant and movement expert with Process Matters) and Daniel Apfel for their incredibly generous contributions in both framing and helping us achieve literacy in philanthropic practices. With a little cash we imagined we could do big things. The collective envisioned a transition where we’d slowly shift decision-making and power to a group of solidarity economy practitioners who would become the founders and owners of the new organization. We gathered a steering committee, seeking sectoral representation, and eventually Lower East Side People’s Federal Credit Union,The Working World, New Economy Project, New York City Network of Worker Co-ops, and SolidarityNYC signed on. This included Linda Levy, Brendan Martin, Sarah Ludwig and Deyanira del Rio, Chris Michael, and Cheyenna Weber. We knew most of these groups well: Cheyenna was on the Board of Lower East Side People’s Federal Credit Union and we’d made a film about them featuring Dey from New Economy Project (then called Neighborhood Economic Development Advocacy Project); Annie had interviewed Brendan from The Working World for our report and Cheyenna worked closely with him during Occupy Wall Street; Michael had been present for the founding of NYC Network of Worker Co-ops and Cheyenna had also been attending their meetings. Together we committed to a coalition-building process from fall 2013 to spring 2014: each organization would convene a focus group and together we’d write a report and present our findings at a funders’ briefing where we’d seek philanthropic support for either a new organization or perhaps a program within an existing organization. Cheyenna would be in a paid role as an organizer supporting the steering committee and other SolidarityNYC members, now including Kenneth Edusei, would play supporting roles as volunteers, some as part of their academic research. The first steering committee came up with a name: Cooperative Economics Alliance of New York City (CEANYC, pronounced ‘scenic’). The focus groups funded by Rockefeller mostly confirmed what we already knew from the qualitative interviews: people wanted this information and the network, but couldn’t resource it themselves; sectors knew surprisingly little about each other; most groups were working in isolation or at the periphery of larger social movements; and all of the groups needed significant resources both in capital and technical assistance to survive, let alone thrive. Perhaps least surprisingly, we kept identifying that the people engaged in solidarity economy work at the grassroots level were majority women, majority people of color, and primarily low and moderate income. What was surprising was that those groups were rarely represented in the visible “leadership” of these sectors, which tended to be white, cis-male, heterosexual, English-speaking, highly educated, and upper middle class. Another core component of what would become CEANYC’s strategy emerged: create a pipeline for grassroots leaders to become visible to dominant power structures, and transform dominant power structures to see and view the grassroots work of women of color as leadership. SolidarityNYC likewise responded by convening an informal peer group for women and gender non-conforming people — Everyday Solidarity for Everyday Sexism — to specifically address sexism in solidarity economy fields. Some of these observations made it into the CEANYC 2014 Summary of Findings Report that the steering committee wrote for funders, and others we kept internal. Racial justice was added to the definition of ‘solidarity economy’ in CEANYC’s mission statement. The 2014 funder’s briefing at Rockefeller did not result in funding despite Eddie’s cheerleading. Partly this was because of emerging rocky dynamics in the steering committee—which was the logical group to take up the fundraising—and SolidarityNYC, which was eager to hand over leadership but also sought to hold the vision we’d been building for five years. There were several reasons for this. One of the most established and well-funded groups involved had hoped to own the result of this work, building a coalition to pursue what we’d learned together. Despite the weekly meetings and many hours we put in together, we never did achieve full clarity among what the different roles our groups would play if CEANYC became its own organization. This led to confusion, mistrust, and apprehension that was very difficult for the group to discuss, particularly at the end where a sense of urgency pervaded the funder briefing preparation. Second, sectoral network representation was lacking on the steering committee, leaving the group vulnerable to the priorities or desires of individual groups and personalities. Sectoral associations had been invited, and all participated in the focus groups, but they did not have deep enough investment to join the steering committee at this stage. Third, the steering committee struggled to properly acknowledge each other’s work and investment in the project, and infighting over credit before presenting to the funders occurred. Finally, SolidarityNYC naively assumed a common cooperative culture existed amongst solidarity economy actors and was unprepared to address the fairly ordinary nonprofit industrial complex issues of funding turf that arose. Ultimately, all of this was tough to navigate and many of the groups involved carried some degree of baggage by the end of their tenure on the project. We learned the hard way that a cooperative culture would have to built and we'd need strong representation by solidarity economy networks in the process to help shield against the whims of a single organization or individual. The conflict and confusion in the steering committee process hugely impacted funding. At least one funder who already had a relationship with a steering committee member organization believed that CEANYC would approach them after the briefing. This did not happen because of the emotions and politics in the steering committee and that group’s refusal to make funding connections, and SolidarityNYC was not skilled enough in fundraising to know what next steps to take. Eddie was leaving Rockefeller, so we lost our champion, and we had naively mistaken his advocacy for institutional commitment. Without strong commitments from the founding groups or funding to carry forward the next steps, the project fell back in the SolidarityNYC’s lap, albeit further along than before. We needed a new group to pick up the work of creating the structure for the organization. The second steering committee cohort ran from 2014 to 2016 and included Black Women’s Blueprint/WHEELS Collective, New York City Community Gardens Coalition, The Working World, Brooklyn Movement Center, SolidarityNYC, Park Slope Food Coop, and the former Executive Director of the National Federation of Community Development Credit Unions. The individuals included Christina Jaus, Mara Gittelman, Brendan Martin, Mark Winston Griffith, Cheyenna Weber, William Ferrullo, and Cliff Rosenthal. This group oversaw the creation of draft bylaws, membership benefits, a website and print materials; the first membership drive in summer 2015; the establishment of a fiscal sponsor and bank account; and the first election and annual meeting in spring 2016. Cheyenna staffed the process as an unpaid organizer and SolidarityNYC members, now including Ben Blackshear and Arsenia Reilly-Collins, supported in volunteer roles. The collective also continued its core mapping, education, and research work, including a new walking tour put together by Ben and a brief history project in partnership with Jocelyn Wills at Brooklyn College. We also maintained the Everyday Solidarity group with a small grant from New Economy Coalition and spun off a men’s group as well. Evan sat on the steering committee and have testimony in support of the Worker Cooperative Business Development Initiative. Many of us also sat on board of local co-ops or national solidarity economy organizations, continuing to deepen our collective knowledge and network. While the steering committees were working, SolidarityNYC continued to meet monthly to discuss the process and determine next steps. The collective remained committed to the leadership of solidarity economy practitioners but also bore responsibility for having brought those groups together and holding a vision for their work. In the meantime, the groups continued learning the solidarity economy framing and built relationships to each other. We struggled to maintain this balance of avoiding being overly directive while also demonstrating leadership from the vast knowledge we had begun to acquire on the subject of cross-sectoral solidarity economy organizing. We knew we had to transfer knowledge, and we got creative in how we approached it. This knowledge came from the same sort peer-to-peer relationships we were building locally, only this time we took them on the road. Throughout 2014 and 2015 SolidarityNYC was leading #SolidarityCities delegations, organized by Cheyenna, to learn how other municipal solidarity economy work was organized and resourced. These trips included Philadelphia, Syracuse/Ithaca, and Montreal. They were open to all members of the CEANYC steering committee and to solidarity economy leaders or organizations who were invested in building CEANYC and an NYC movement. Participants included Cheyenna Layne Weber, Ben Blackshear, Lauren Taylor Hudson, Olivia Geiger, Dan Apfel, Lauryl Berger-Chun, Evan Casper-Futterman, Morgan Crawford, Brendan Martin, Scott Trumbull, Karen Haskins, William Ferrullo, Michael Sandmel, and Zara Serabian-Arthur. These individuals represented primarily SolidarityNYC and CEANYC, but also had home organizations/co-ops in the solidarity economy as well. The delegations studied conditions, organizations, culture, and networks in each locale and analyzed them for similarities or lessons applicable to NYC. (You can read more about our findings for Quebec, Philly, and upstate New York.) All of this work, and all aspects of the trips, were unfunded and covered by participants themselves. As SolidarityNYC learned more about how other groups had conducted cross-sectoral organizing, the challenges of the NYC situation became clearer. Unlike in Philadelphia where the National Cooperative Business Association (NCBA) had decided to foot the bill for the start up costs of the Philadelphia Area Cooperative Alliance (PACA), or in Montreal where both the state and unions covered much of the costs for l’Chantier d’Economie Sociale, in New York we were without clear paths to support from the state, labor, or national co-op/solidarity economy organizations. In fact, NCBA courted CEANYC for the same program they had offered to PACA and Austin Cooperative Business Association, but they closed it due to a lack of funding and institutional commitment during internal transitions and we never received support after participating in their process for two years. Even as the steering committees met and did their work laying the foundation for a democratic membership organization, SolidarityNYC remained deeply involved in our existing networking activities and sought to identify potential funding. Cheyenna again conducted most of this funding search unpaid, with substantial support from collective members, elders, and allies who gave their time and consideration. It was SolidarityNYC’s relationship to Park Slope Food Coop that ultimately allowed CEANYC to create a partnership for food co-op members to work their required member shifts at CEANYC, a source of in kind solidarity support that literally made CEANYC possible and averaged around $30,000 a year in saved staffing costs. This support allowed us to finally formally launch the organization. CEANYC officially spun off from SolidarityNYC at the first membership meeting and Board of Directors election in spring 2016. The first Board included two SolidarityNYC members, Evan Casper-Futterman and Arsenia Reilly-Collins, and collective members volunteered their time to strategize and run the event. Since then, CEANYC has continued to grow its own capacity as an organization and determine an identity distinct from the collective. Meanwhile, collective members have played pivotal parts in the programming and operations: Ben Blackshear and Evan Casper-Futterman have supported fundraising; Lauren Taylor Hudson and Zara Serabian-Arthur have acted as sometimes-paid peer educators offering workshops and designing curricula; Olivia Geiger has supported research and strategy; and Cheyenna has acted as the sometimes-paid founding executive director (which CEANYC calls General Coordinator) overseeing all of the above. Even now, as CEANYC has just elected its second Board of Directors, and is growing its influence, budget, and service offerings to both members and social movements, SolidarityNYC collective members hold the movement perspective that helps keep the organization accountable to its solidarity economy origins despite the influence or inertia of more apolitical co-ops among its membership. We started with only a handful of people familiar with the term ‘solidarity economy’ and supporting a larger vision for social change (including Dan Apfel and Cliff Rosenthal at the National Federation of Community Development Credit Unions) it now is in increasingly widespread use among those active in co-ops, community gardens, and social movements. Fewer silos! People are thinking of their work in a broader context of solidarity economy. CEANYC has successfully knit together groups that previously did not have involvement with each other. We’ve seen an increased interest in the politics of the term solidarity economy, perhaps as terms like ‘new economy’ have risen to prominence. There is increasing interest from funders in solidarity economy, but they call it ‘inclusive economy’ or ‘community wealth building’ and usually with a neoliberal lens that often undermines mutualism. We have changed how we relate to other people in our region, and have built more relationships between solidarity economy actors in our region. Sectoral networks have grown and faded in importance over time, underlining the wisdom shared with us by le Chantier in Montreal that a crucial function for an apex organization is to observe and respond to these changes. While incubating CEANYC the collective has found our energies were and are mostly directed towards building that group’s capacity. It has taken longer than any of us imagined, but our work continues to build towards our shared vision of a vibrant solidarity economy movement in New York City. In the meantime we meet to discuss individual work, connect on movement issues, and we still host an informational website and map. But perhaps not for long, as CEANYC may soon take over that work as well. When that happens we’ll have come full circle by transitioning ownership of the very first asset we created back in 2009 to the solidarity economy groups themselves through CEANYC. Will we have worked ourselves out of our unpaid jobs or into another project? It’s too soon to tell what the collective will want to do then. Maybe we’ll sunset. No matter what, the work of going beyond co-ops to the language of cooperation, to developing a deeper understanding of how solidarity economy underpins our existence and what we can do to ensure its growth and survival outside of just the formal groups that comprise CEANYC, remains for the next generation. If you would like to learn more about this work or have resources to offer please contact info@solidaritynyc.org.